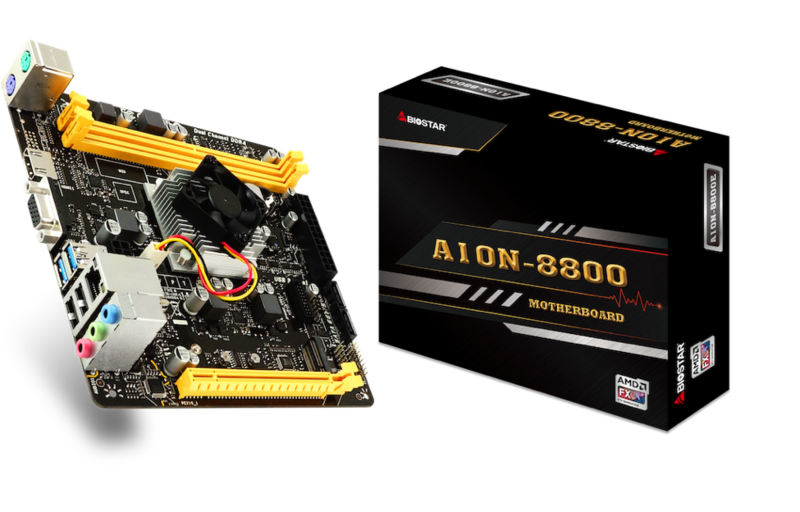 February 25th, 2019, Taipei, Taiwan – BIOSTAR, a leading manufacturer of motherboards, graphics cards, and storage devices, launches the gaming-ready A10N-8800E SoC motherboard. The BIOSTAR A10N-8800E sports a compact mini-ITX form-factor, perfect for small-form-factor gaming PCs and HTPCs. 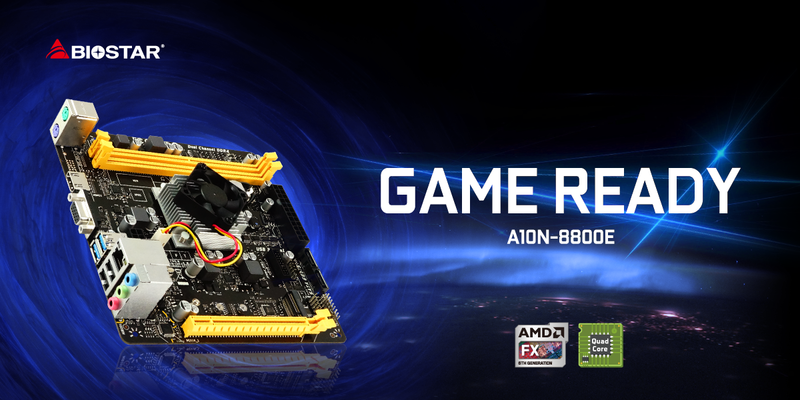 The A10N-8800E packs a powerful Carrizo architecture-based AMD FX-8800P quad-core processor with an integrated AMD Radeon R7 Graphics for superb processing performance, power efficiency and game-ready graphics. 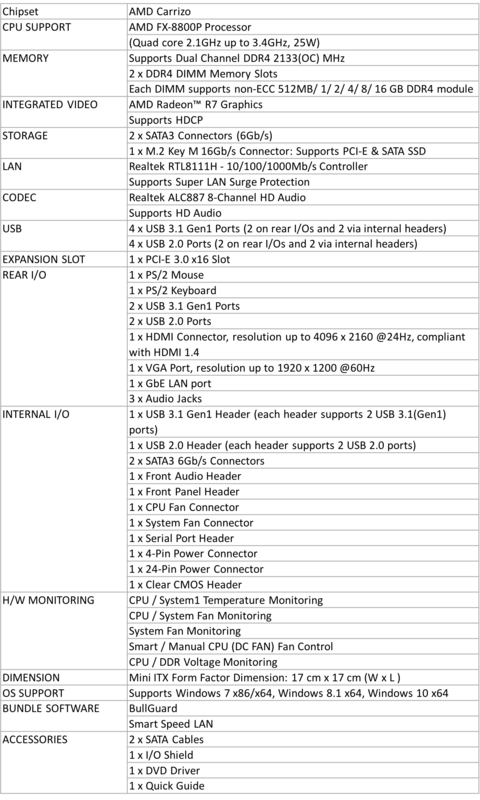 The A10N-8800E supports dual-channel DDR4 memory, up to a speed of DDR4-2133 and a maximum capacity of 32GB (2x16GB). The motherboard also packs 1 x M.2 Key M 16Gbps slot for high-performance PCIe NVMe M.2 solid-state drives. The BIOSTAR A10N-8800E features the Carrizo architecture, an integrated AMD APU with an integrated Southbridge controller block for the I/O port, making this a truly full integrated System-On-Chip solution. The AMD Radeon™ R7 Graphics is a 25W low-power integrated GPU that delivers immersive gaming graphics superior to Intel’s integrated graphics counterpart. The BIOSTAR A10N-8800E SoC Motherboard features the exclusive Super LAN Surge Protection, advanced anti-static protection that strengthens electrical stability and prevents damage from electrical surges and lightning strikes. The A10N-8800E also supports H.256 decoder (H.265/HEVC Support), supporting up to 4K resolution via HDMI without discrete graphics. This enabled high-definition resolution on 2K/4K displays for detailed images and videos for greater entertainment enjoyment from the likes of YouTube and Netflix through the rear I/O HDMI port. The BIOSTAR A10N-8800E packs high-speed connectivity and support for high-performance storage devices to meet the demands of gamers and power users. The A10N-8800E packs USB 3.1 Gen1 ports with 5Gbps transfer speeds. It also packs a single M.2 M Key 16Gbps slot that supports high-speed PCIe NVMe M.2 solid-state drives for high-performance gaming systems with fast loading and booting up times. 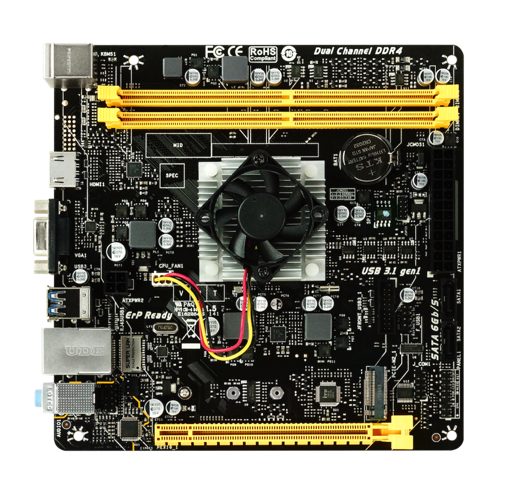 BIOSTAR A10N-8800E SoC Motherboard packs a Realtek ALC887 7.1-Channel high-definition audio to deliver immersive audio for superior gaming experiences. The BIOSTAR A10N-8800E rear I/O ports include: 1 x PS/2 Mouse, 1 x PS/2 keyboard, 2 x USB 3.1 Gen1 ports, 2 x USB2.0 ports, 1 x HDMI, 1 x VGA, 1 x GbE LAN port, and 3 x Audio connectors. The BIOSTAR A10N-8800E SoC Motherboard is a compact gaming-ready solution packed with all the essentials with great power efficiency. The A10N-8800E is the perfect motherboard for compact gaming PCs and next-level entertaiment HTPCs having support for high-definition 2K/4K displays.